Daley Thompson CBE is recognised as the World’s Greatest All-Round Athlete. Daley claims more decathlon honours than any athlete before or after him. Daley Thompson was Olympic Champion in 1980 and 1984, World Champion in 1983, European Champion in 1982, 1986 and Commonwealth Champion in 1978, 1982, and 1986. He set four World Records (8648 in 1980, 8730 and 8774 in 1982 and 8847 in his Olympic triumph in Los Angeles in 1984). 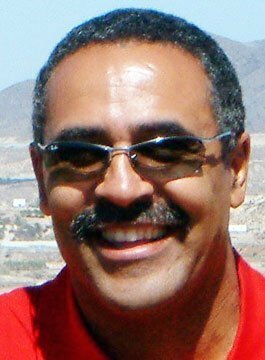 Daley Thompson retired from athletics in 1992 as a result of injury, and went on to play football for Mansfield Town FC, and became a fitness coach to Wimbledon F.C., Luton F.C., Boris Becker, Tim Henman and The British Davis Cup Tennis Team. Daley was voted BBC Sports Personality of the Year in 1982. He was awarded the MBE in 1982, an OBE in 1986 and advanced to CBE in 2000. Daley Thompson was a leading ambassador for the winning London 2012 Olympic bid. He focused on highlighting the benefits that hosting the Olympics would bring to education and sport in schools, and he played a key role lobbying the international IOC members right down to the final vote in Singapore. Daley is also involved with two major charities, Laureus Sport for Good and Barnardo’s. He is an active supporter and works with both charities to promote their good work. Achieving success on the track is not a sole effort – it requires a team effort. A good athlete needs to surround himself with experts – physios, doctors etc – to help them achieve their goals. This analogy can transpose into the workplace where success is dependent on good teamwork. Using video footage, anecdotes and personal stories Daley shares with the audience how he managed to work on both his strengths and weaknesses to achieve his ultimate goals. Every person in the audience will be able to relate to his talk and identify with areas.